Scientists dealt a blow Monday to the quest for organisms inhabiting worlds besides Earth, saying our planet was unusual in its ability to host liquid water—the key ingredient for life. This would happen when the young, dim star of an icy, lifeless planet—such as early Earth—starts warming, becomes Sun-like, and melts the ice on planets orbiting it at just the right distance—the so-called "Goldilocks" zone. Icy orbs in our own Solar System, including Jupiter's moon Europa and Saturn's Enceladus, or "exoplanets" in other star systems, may become habitable in this way, the theory goes. Without atmospheric greenhouse gases—a feature of Earth—the energy required to thaw an icy planet would be so high that it would transit from frozen to inferno without an intermediate, liveable phase, they found. "We find that the stellar fluxes that are required to overcome a planet's initial snowball state are so large that they lead to significant water loss and preclude a habitable planet," the team wrote. Among these, Europa and Enceladus will likely morph from iceballs into fireballs by the time the Sun reaches it's super-hot red giant phase heat in billions of years from now, said the team. But humankind's addition of mainly CO2 since the Industrial Revolution has caused the atmosphere to retain ever more solar heat, to a point that scientists say we are harming Earth's perfectly-balanced climate beyond repair. In the last paragraph, it might be truer to say the changing temperatures are destructive to humans and to all currently-existing ecosystems, rather than destructive to life or the atmosphere in general. Of course some or even most "Other Planets" may never be as hospitable as Earth. But out of billions upon billions of planets some will be even more hospitable than Earth. scientists say we are harming Earth's perfectly-balanced climate beyond repair. This is a example of fake news we should all be incensed at! That's just silly anything is repairable with enough technology. "Other planets may never be as hospitable as Earth: study"
Astronomer Mike Brown should be concerned that his simulation predicting Planet Nine may be wrong too. I am patiently waiting for the day when Mike Brown admits the outer solar system is more dynamic than we thought and his simulation did not account for all the variables, such as gravitationally-significant objects passing by the solar system over the eons. My more fundamental point is that simulation alone is not enough to get an accurate picture of what is out there. There is no substitute for boldly going where no one has gone before. "There is no substitute for boldly going where no one has gone before." this article is loaded with crap. Even Titan is more hospitable to life that evolved on Titan than that the Earth is to life from Titan. Bring Titan life to earth and it will perish just as fast as Earth life would perish on Titan. There are billions of types of life that evolved on billion of different places and each would be more hospitable to its own lifeforms than others. The writer assumes that only Earth Life counts.. There may be much better lifeforms out there more sturdy to inhabit more places of our Universe. Unfortunately, scientists like Mike Brown are cut from a different cloth than the military test pilots that pioneered the space program. At the first hint of danger they go running to hide in there offices. And, since they took control of NASA in the 70's, this is why manned space flight has mostly gone nowhere in 40 years. "humanity" or "mankind". "humankind" is not a word. ...used climate models to simulate the evolution of icy planets. And current climate models are totally reliable because shut up, denier. ...thanks to planet-warming atmospheric greenhouse gases emitted by volcanic eruptions during its snowball phase. The latest estimate is tens of billions of earth-sized planets in the habitable zone in the Milky Way. Since planets grow by accretion, with larger and larger bodies slamming into each other, it seems logical that by the time it reaches earth size, there'd be plenty of internal heat to generate enough volcanism on every one of them to melt any ice. That doesn't even include larger moons of gas giants, and planets further out with subterranean oceans heated internally so it seems the researchers are being a tad pessimistic in their estimate of potentially habitable worlds. "humankind" is not a word. Oh wait! there is a way! Maybe they didn't get your memo? Greenhouse gases are not unlikely, I don't understand the article . In our solar system all the rocky planets except mercury have green house atmospheres, mars, earth, and Venus. Even some moons. Europa does not have it, but even on this one an asteroid impact could create it easily, it probably happened but Europa was simply too far away to trigger the conversion . A diffrerent thing is if it is too much or too little , but probable ? A lot! It's ok, since everyone on here understood the meaning. The ones I hate are the people that jumble up words just to TRY to prove how smart they are. Billy Meier writes that according to information originating and passed on to him from the highest spiritual level, published in his book Genesis, a total of 40,353,607 (40 million 353 thousand and 607) human races were originally created into existence by Creation. Meaning in our Universe as a whole, in the Galaxies, Sun systems and Planets through out, through the law and commandments and the Ur-idea of Creation 40,453,607 races was created with 343 different skin colors. This number has further increased over time due to many races have mingled and created new ones. Wherefore the total number of races in our Universe today can be counted in vigintillions, a number with 63 zeros. – 7 Million sun systems have planets where life exist, both human and non human, meaning insects, fish animals etc. There are about 3.67 million human civilizations with the split 2,63 million highly developed and 1,04 million lower developed. The simplistic writer cannot imagine a changeable world/solar system/ stellar neighborhood. That said, every lifeform will look on his/her/? home planet as the ideal home. The real question is whether humans can adapt to the different worlds we are going to find. All life on worlds come from primitive forms, so all had to adapt or go extinct. Many DID! AS it is here, so shall it be in other systems. Give life credit for adapting. We have tube worms on our world that live at 600 deg C under water at tremendous pressure by volvanic undersea vents. Worlds are born of accumulation and get molten cores as they 'grow' Heavy radioactive elements sink over time. There is the heat. Lots of rocks crushin' each other from others over them. Thats pressure. Add water to the mix as water litters space---Steven Hawking.. All planets seem to grow this way. Mars was once like earth. Older, our life may have come here from there. Maybe Mars AND Earth got life from space too. "Other planets may never be as hospitable as Earth"
The most ridiculous title I've ever seen here. 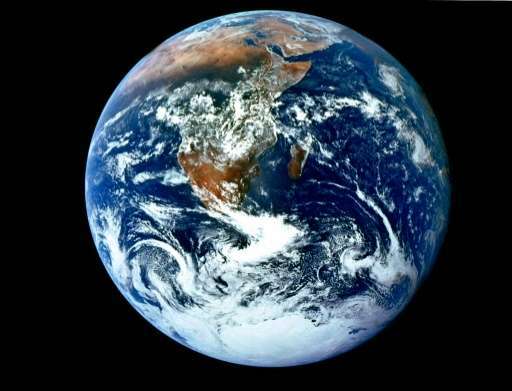 Earth has some features we have not found elsewhere, life being one of the major features. We cannot predict probabilities with a single instance. We will need to examine other worlds sufficiently to determine if any of them are habitable and if any of them host life. Until then, there is nothing on which to base an opinion. This article is right on target. The chances of another planet being as hospitable to humans as here on earth is essentially zero. Life, including us evolved constantly adjusting to the history of the earth. The chances of another planet in our galaxy having the exact same history is nearly an infinity to one. T hospitable to humans as here on earth is essentially zero. Life, including us evolved constantly adjusting to the history of the earth. The chances of another planet in our galaxy having the exact same history is nearly an infinity to one. Which essentially means there would be a infinite number matching earth. Now I doubt that but the odds are there are a lot like Earth. "But humankind's addition of mainly CO2 since the Industrial Revolution has caused the atmosphere to retain ever more solar heat, to a point that scientists say we are harming Earth's perfectly-balanced climate beyond repair." Kinda sad to see theology ruin a science article. tblakely1357 I didn't read what he said because I have already muted/ignored him, but my guess is you have been bitten and baited by a trol. Are you going to play the fool and respond to the troll or ignore/mute the troll? It is incredible how many people actually accept fictional entertainment as universal facts. Among all the other errors of ignorance you guys are making? The most important and most ignored? How do you convince women to take the severe risks of bearing babies in deadly environments amid competitive lifeforms? Considering that all too many of you have already failed to convince women to breed for you, in this deadly environment? Amid all the competitive lifeforms of this world? Huh? Sounds like a lot of unintelligible babble to me. That's just what this world needs another hacker who doesn't even have enough sense to target his audience. You notice he is from a sub culture who does not know right from wrong. rderkis, lets see if I can express some babble that is intelligible? I certainly agree with you about the moron studying to be a cretin offering his/her/its services as a hacker. However I do disagree with your conclusion that hackers are a subculture unable to tell the difference between right and wrong. The Official Motto of Western Christian Civilization is, and always has been: "What is Mine is Mine...What is yours is going to be Mine. As soon as I have robbed, raped and murdered you for it!" Well, since You Fine Fellows approve of such behavior. Don't whine when super-tech does unto you as you would do unto others! The Official Motto of Western Christian Civilization is, and always has been: "What is Mine is Mine...What is yours is going to be Mine. As soon as I have robbed, raped and murdered you for it"
I have lived here all my life, my friends have lived here all their lives, At 70 I have had many coworkers that have lived here all their lives. NONE of these or anyone else I personally know, have ever heard your imaginary made up moto. The earlier comments approve of annihilating other worlds biospheres. Again with the hypocrisy. It baffles me how people who claim to be upright law abiding, piously correct insist that they can be predators because someone else committed criminal acts. Making self-righteous excuses for evil behavior. Or at least until you find you and yours as the prey. I would prefer to think better of myself and act accordingly. We are all predators, living on other living things. That is what a human being is. I am guessing here but only some green plants that get all their nourishment from photosynthesis would not be considered a predator. In the long term humans may deliberately change these icy worlds to make them melt. Perhaps they could spread light black material over the surface so that it absorbs more energy and then causes the ice to melt. We will probably just change our genes to live there. That will be very easy to do then.